Back in 1982, David Lucas decided to dig a pond. 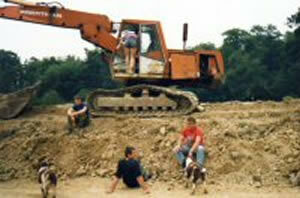 He persuaded some good mates, hired an excavator and set about a small swampy area on his brother-in-law's farm. At the time, David was working as a garden contractor and tree surgeon, and quickly begged, stole and borrowed plants, shrubs and cuttings from anyone who looked like a suitable donor to his project. Before long, the grass grew back, the new plants took root and started to grow, the pond filled with water – and suddenly, David was admiring his handy work. And quite rightly so. This project became known as Old Pond, which later became Penny's Pond. Today, Penny's Pond is home to a selection of wildlife including the many fish who feed as readily as piranha. Not satisfied with the one pond, it was only a matter of time before David (who was by now living on the farm with Dianne) and friends including Nigel Firth decided it would be fun to make another pond – only a bit bigger. Woodpeckers Fishery is a family-run business. 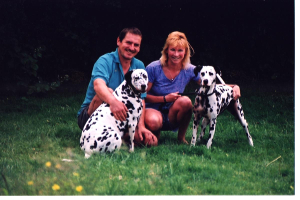 David and Dianne Lucas (and our Dalmatians) warmly welcome both regular and new anglers to our friendly fishery.